Tokina's latest pro-spec AT-X zoom lens offers a wide 17-35mm focal length and a constant f/4 maximum aperture throughout the range. 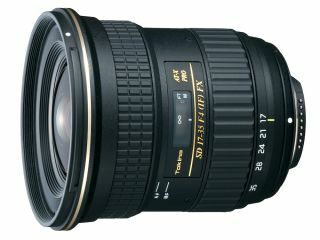 The Tokina AT-X 17-35mm F/4 is available for Canon EOS or Nikon-D cameras. Designed for use on a full-frame body in, the widest setting offers a 103.9 field of view. This is useful for shooting in tight spots where you can't physically move farther from the subject. Fitted to a camera with a smaller APS-C sensor, the effective focal length becomes a much less exciting 27-56mm. The minimum focus distance of 28cm means that this lens is effective at showing close subjects in relation to their surroundings, while a nine-bladed aperture offers more attractive rendition of out of focus areas of pictures. Two Super-Low Dispersion glass and one aspheric glass elements have been used in the lens's construction to improve sharpness and reduce chromatic aberration. Improved seals around the moving parts should make it more water resistant that previous lenses (although it's not waterproof). Finally, Tokina's One-touch Focus Clutch Mechanism enables you to shift between autofocus and manual focus by snapping the focus ring backwards and forwards. The Tokina AT-X 17-35mm F/4 PRO FX lens UK price is £828.99 and it's available now.